The General Secretariat Against Corruption (Greece), has created a campaign to raise citizens’ awareness of integrity issues. The fight against corruption is one of the most important priorities for the Greek government. With this target and based on the European and international best practices, the General Secretariat Against Corruption (G.S.A.C. ), was established by law with the number 4320/2015. Responsible for its operation is the Deputy Minister of Justice, Transparency and Human Rights, who is responsible for the fight against corruption. It is an institutional coordinating body with duties of supervising and taking initiatives at political and legislative level for all anti-corruption services. It has also been designated as the Anti-Fraud Coordination Service (A.F.C.O.S.) for the funds that the country receives from the European Union. The General Secretariat Against Corruption as a part of the National Strategic Anti-Corruption plan in Greece, has recently launched a campaign, aiming to raise the citizens’ awareness of the negative impact and results that corruption causes to the Greek society. With the technical help of the Organization for Economic Co-Operation and Development (O.E.C.D.) 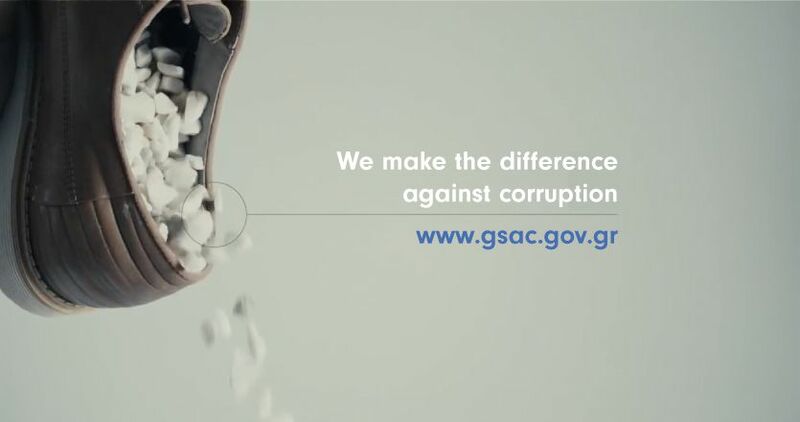 and for the need of promoting the campaign that which has mentioned before, a video has been created, presented and shown for the first time at July 2017 , at the GSAC’s two-day conference where the subject was ‘’Enhancing Integrity in the Public Sector’’. Through this short video, they are indirectly affected many forms of corruption such as bribery, abuse of authority etc. The semiotic references at this video are plenty. Each corruption phenomenon parallels with a gravel. All those ‘’gravels’’ as time passes, are multiplied. . As long the video continues, the viewers watch the gravels getting in a shoe. This shoe parallels our society and each citizen of us. And as long as we do not do something to solve the problem, these gravels prevent us from moving on. The video is going to be shown from the General Secretariat’s Against Corruption YouTube Channel in order to motivate and troubleshoot the internet users by sending to the digital environment the message that corruption is a disease that needs to be healed. The impact of corruption, especially in the case of Greece, is making damage to our social and economic issues. The consequences are very serious. Therefore a substantial and concerted effort is needed both from the public and private sector to fight corruption. The Greek Government has a comprehensive policy that intervenes both in preventing and facing the phenomenon with the coherent Secretariat’s action, the implementation of National and Strategic plan, the identification of existing outbreaks of corruption and their eradication, prosecution and enforcement sanctions, sensitization of society and change of behavior and perception in the relevant issues.